A self-styled "patriotic" movement called the Three Percenters is setting up chapters across Canada. They're anxious about open borders, sometimes armed and ready to fight "tyranny and terrorism both foreign and domestic." When hundreds of white supremacists staged a march in Charlottesville, Va., last August, most of the attention was on the counter-protester killed when a vehicle, believed to have been driven by one of the marchers, plowed into a crowd of pedestrians, and on the controversial statements made about the event by U.S. President Donald Trump. There was little news coverage, however, of an armed group called the Three Percenters, whose members, dressed in paramilitary gear and carrying guns, attended the rally, acting as a self-styled security detail independent of law enforcement. The name of the group is a reference to the claim — debated among historians — that only three per cent of Americans took up arms and served in George Washington's Colonial Army in the American Revolution against the British. The group says its main goals are to protect the right to bear arms, defend against an "overreaching government" and "push back against tyranny" but claims on its website that it is not a militia and not anti-government per se. The group was established in 2008 and picked up steam after the election of Barack Obama as U.S. president, part of a broader growth of anti-government groups that some observers have dubbed the patriot movement. Mack Lamoureux of the news site Vice first reported last spring that the Three Percenters had established a chapter in Alberta. Nearly a year later, CBC's The Weekly has uncovered details about the group's growing membership, including a newly established chapter in Ontario and members spanning every province. "They are the most dangerous group right now," said Maxime Fiset, a former neo-Nazi who works with the Centre for the Prevention of Radicalization Leading to Violence in Montreal. He has been monitoring the group since they first formed in Canada. "It's a deep paranoia and an American way of libertarianism," he said. "There is a feeling of dread and anxiety. I've known people who feel threatened by the outside world. The Three Percenters are increasing their ability to fight back." 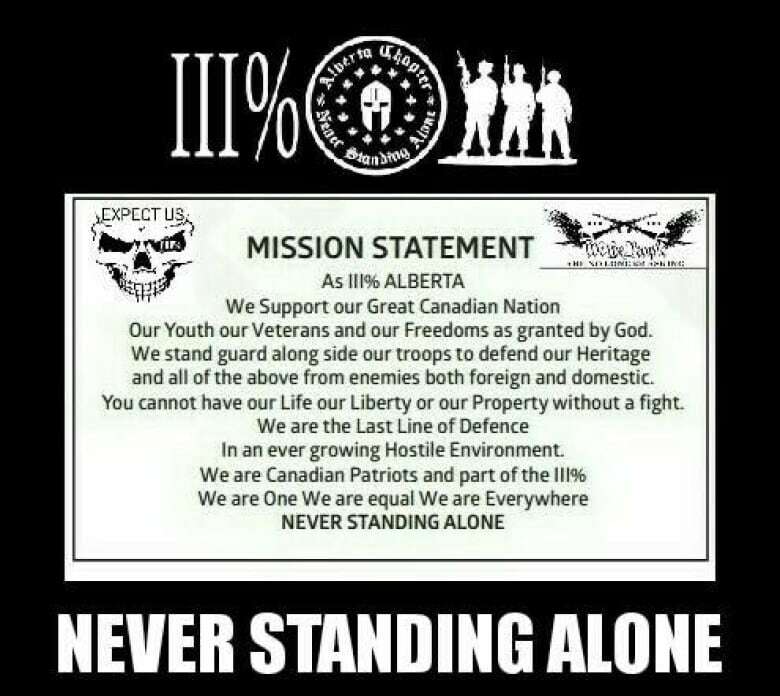 The Three Percenters' private Facebook groups reveal the Alberta chapter has nearly 3,000 members, although the Vice report estimates only 150 to 200 are active. The Ontario group, formed in fall 2017, has more than 600 members, although it's unclear how many are active. Like their American counterparts, the Canadian Three Percenters say on Facebook that they are armed and ready to defend themselves against the government, should it turn tyrannical. They call themselves a patriot group whose members include "military … ex-military … first responders … police members … every day labourers and business owners." Some of their Facebook posts suggest you need to be a licensed gun owner to be an active member. They say their mission is to defend Canada's heritage from enemies, both foreign and domestic. But one of Canada's leading experts in hate crimes, Barbara Perry, a professor at the University of Ontario Institute of Technology in Oshawa Ont., who has studied the group says it is actually "a far-right 'prepper' militia movement that is actively arming and engaging in paramilitary training." 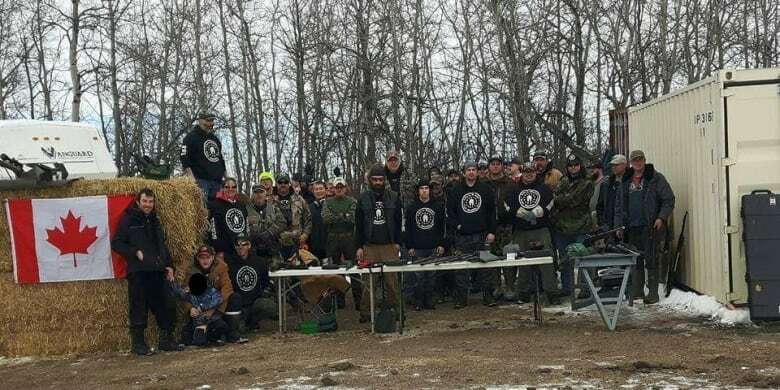 Militias are not technically illegal in Canada, but some armed groups that engage in military-like training risk violating parts of the Criminal Code. Perry says Islamophobia is the ideology that underpins the Three Percenters. "The Alberta group is actively training to defend Canada from what they see as the inevitable invasion by Muslims," she said. The Canadian Three Percenters became more active after the election of Justin Trudeau in 2015. Facebook posts reveal a mounting fear of Muslim refugees and open borders. Some members even claim Trudeau is a Muslim convert himself, calling him "Jihad Justin" — according to screen grabs of posts from the closed Facebook groups of the Ontario and Alberta chapters obtained by The Weekly. 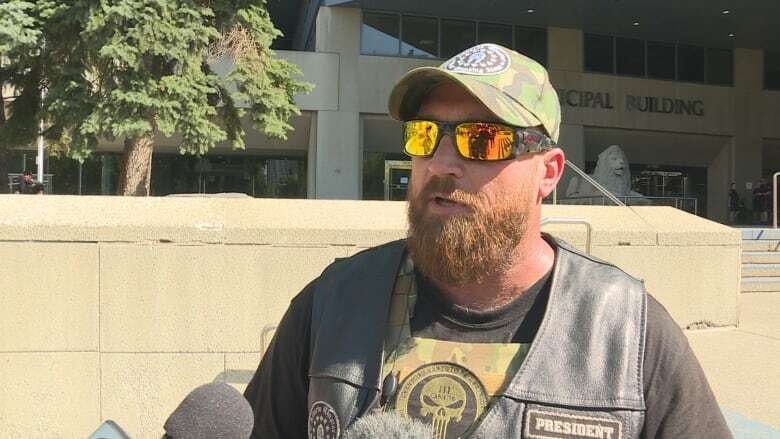 "Domestic terrorism is a huge issue in our country today," Beau Welling, president of the Alberta chapter of the Three Percenters, told The Weekly. "We do accept all religions. We are not anti-Islam, so-to-say. It's the extremism we dislike." But some posts from the Facebook group paint a very different picture. In one, a person posting under Welling's name writes: "The only good Muslim is a dead Muslim." Welling denies writing the post, saying his account was hacked by the far-left group Antifa (short for Anti-Fascists) — a group that has clashed with far right protesters at demonstrations in the U.S. and Canada. He said he had reported the hacking of his Facebook account to the RCMP and the Calgary police. Producers at The Weekly called Calgary police to confirm this and, moments later, got a message from Welling saying he knew CBC was "speaking with the cops." A Calgary police spokesperson later said that they were aware of the claim but said Welling had not made a formal complaint. The Three Percenters use Facebook to plan activities, such as tactical training exercises, monitoring of mosques and what they call security jobs similar to the ones they were carrying out at the Charlottesville protests. 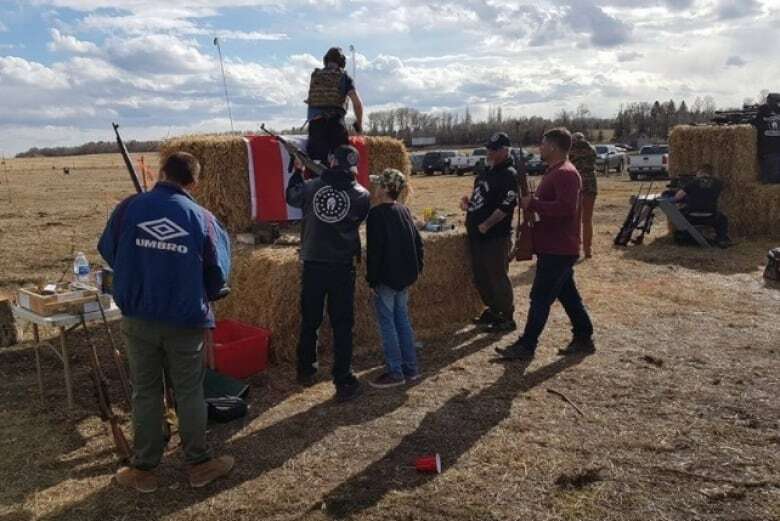 Some members of the Alberta Three Percenters made their public debut in Calgary last June at a rally hosted by the World Coalition Against Islam, fronted by anti-Islam activist Sandra Solomon. Members of the Three Percenters have since posed as "security" at similar rallies in Toronto, London and Hamilton. Their presence at a demonstration at Hamilton City Hall last year opposing the Liberal-sponsored anti-Islamophobia motion (known as M-103) prompted the city council to pass a motion banning groups from hiring unlicensed security for events on public property. "We only need to look at Charlottesville to see how these things can escalate," said Matthew Green, the councillor who introduced the motion, at the time. Welling says that when Three Percenters act as security at rallies, they protect all of those in attendance regardless of political stripe. "We have never had to use our muscle," he said. "We don't want hate at all. We want a free, safe, happy Canada for all people." 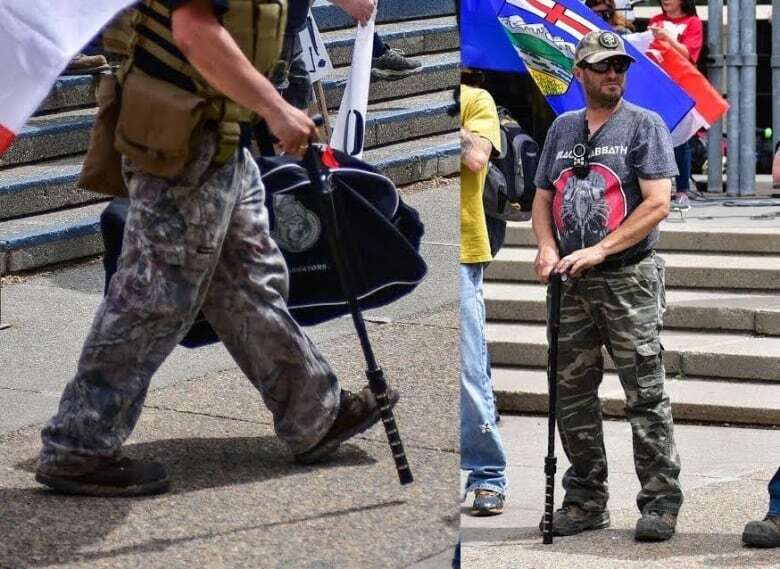 At rallies, members of the Three Percenters dress in fatigues and tactical vests and carry non-lethal weapons called shock canes, used to stun cattle. Openly carrying guns at a demonstration would be illegal in Canada, but members of the group brag about gun ownership and wear T-shirts that say "armed and dangerous." 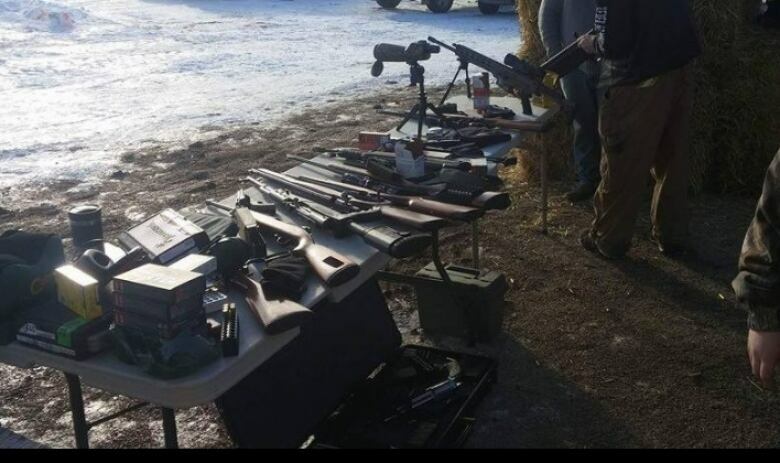 Screen grabs obtained from Facebook include photos of stockpiles of weapons and members engaging in tactical training. Some members of the Three Percenters identify themselves as former members of the military. Fiset said that while for some individuals who sympathize with radical views, the military can act as a "protective measure against radicalization," for others, it ends up being a way to get weapons training and solidify those views. ​"Some come back from Afghanistan with negative views of Muslims, [for example]. Then, you see Trudeau welcoming Muslims into the country. You have military training, nowhere to use it … what do you do?" Welling said that his chapter also has close ties to law enforcement. "We have and still work closely with our local police and RCMP," he said. "Counterterrorism and intelligence. We work many sides." Welling has posted in his Facebook group that he has met with the RCMP and claimed they are "working with us now. Smart move." 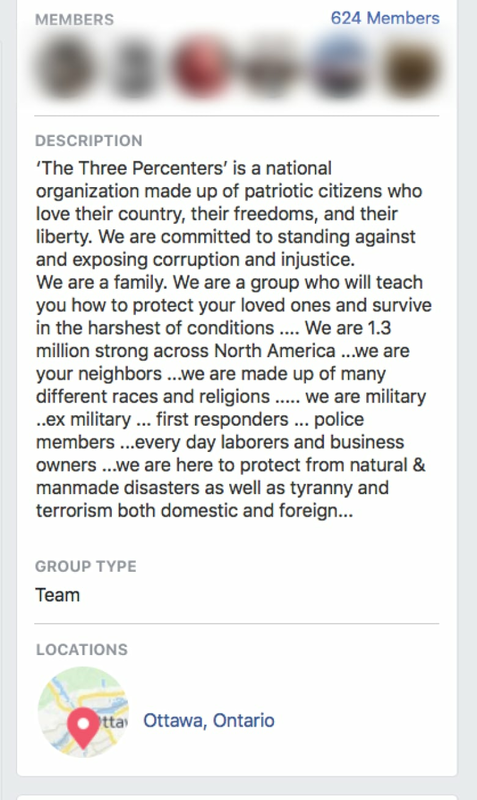 The description of the Ontario Three Percenters private Facebook group also boasts that some of its members are police officers. The RCMP has refused to address the claims of its involvement in the group when approached by CBC. "We do not comment on ideologically based social media groups and have no further comment on this matter," said RCMP spokesperson Staff Sgt. Tania Vaughan. Perry says police should be looking into the group if they aren't already given its targeting of specific communities — such as Muslims. "They are scary," she said. "That combination of guns, training and hate? Not a good combination." A spokesperson for the RCMP said the force does not investigate movements or ideologies but will investigate the criminal activity of any individuals who threaten the safety and security of Canadians. Has an American militia moved to Canada? Radicalization expert Fiset says resources within the police should be shifted away from investigating homegrown Islamic terrorism and put toward far-right groups like the Three Percenters — although he admits that could be a catch-22. "It's a self-fulfilling prophecy, almost daring the authorities to act against them so they can call them tyrannical," he said. "It's a high probability that if the authorities move against one of these Three Percent groups, they will feel legitimized by this act. On the other hand, if the authorities do nothing, they are allowing a situation to endure." Kristy is an associate producer at The Weekly with Wendy Mesley. 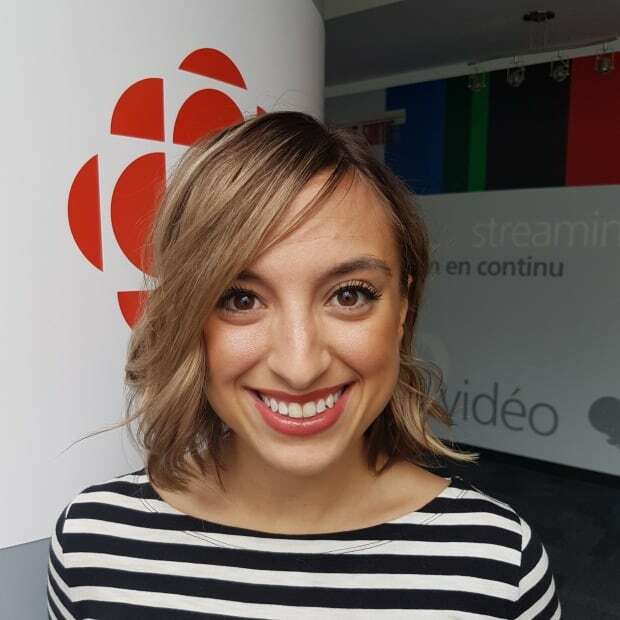 She previously worked at The National, with CBC Toronto and with CBC Radio. She has a masters specializing in international journalism from City University in London (U.K.) and a bachelor's degree from the University of King's College in Halifax.